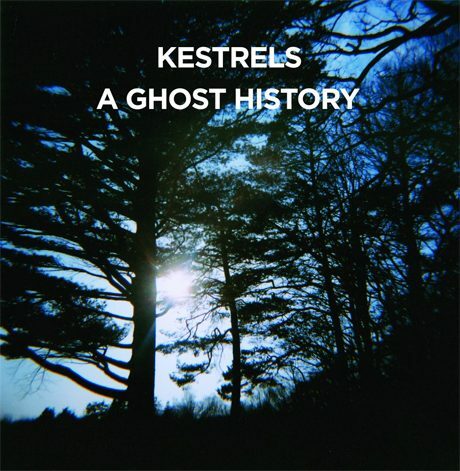 A Ghost History, the new album by Kestrels, is brilliant with a side of swank. This three man group embraces what sets them apart in the music world, which is their 90’s rock style mixed with electrifying song structure. Each track, much like playing with a set of magnets, creates an unparalleled attraction for the listener’s emotions. Chad Peck is the front man for Kestrels, singing while also playing the guitar beautifully and passionately. Devin Peck is groovy playing the bass while Paul Brown rounds up the rhythm section on the drums. A Ghost History is a crown for Kestrels’ discography, which has been royalty in its self. Much of A Ghost History feels raw and invalidated, much like a show played in a garage or house party. A heavily distorted rhythm guitar is played throughout the album with an excellent lead guitar that is as amusing as it is visionary. Chad Peck clearly guides the listener to a retreat designated for the enjoyment of striking music. “Dumb Angel” is definitely a garage track, complete with the clever drumming from Brown and screechy feedback from guitars. “Brindle” also follows the same formula in the scientific experiments that Kestrels brought out of the garage for this album. Staying true to their garage band style, A Ghost History is equipped with a couple tracks that take on a much softer sound, but keep the pattern. “Lose” is a track that demonstrates this softer sound with great success while Keeping with the 90’s style. This track sounds like Chad Peck recording a song on a dubbed over cassette tape, singing with despair from a freshly broken heart. With lyrics like this: ‘Everyone has to wait in line, this is my time to lose’, and a single acoustic guitar baking up the vocals, the feeling of despair enters. Kestrels are not to be confused with, The Kestrels; the 60’s British group that garnered a fair amount of success prior to the emergence of The Rolling Stones and The Beatles. Doing a Google search for The Kestrels will only lead to information that should not be accredited to the trio from Canada. A Ghost History is the embodiment of everything an indie rock album should be. It packs on heavy intrigue with the creative instrumentals mixed with brilliant song writing. Their ability to use quick and sudden transitions adds a cherry on top of this mountain of musical ice cream. Check out Kestrels newest album, A Ghost History, and get ready for your new game of magnets.